Ugly Drum Smoker - Page 522 - The BBQ BRETHREN FORUMS. 1. My drum is ready except for the lid. The lid has a rubber seal. Should I remove that? 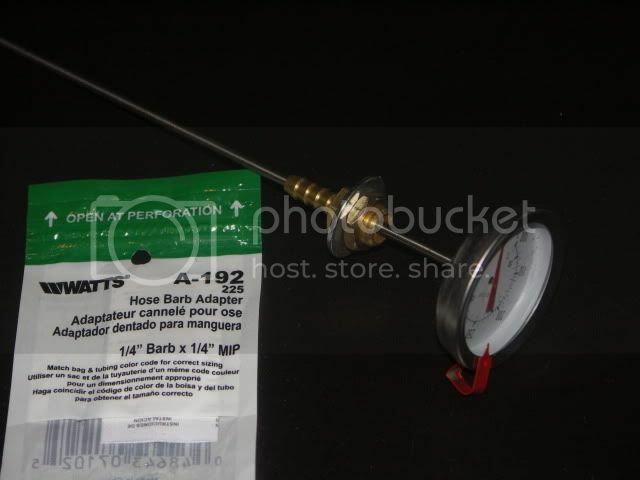 It also has a clamp that I assume I'm going to not want to get hot, pitch it? 2. My lid is bungless. Huh huh huh. I thought about taking a 6in. damper and cutting a smaller hole in the lid. Use some hardware so it rotates. Any thoughts? 3. My Weber lid just sits on top, and I imagine cutting the bead will allow it to fit. Is that accurate? 4. Thermometer. I'm not doing a digital, so what is most common? Thanks for the help. Call me lazy, but 500 pages to sift through seems a bit much. What ever happened to the thick coating for that buoy grill? Ok Ok , you guys don't have " ugly " drums. They are beautiful shiny smoking marvels! I have to buff up my UDS . A thing that is so close to my heart should't be left to rust away in my rainforest backyard! Do I have to sand it right down to bare metal to get a decent quality paintjob? Yes remove the rubber gasket from the lid. Sorry I know nothing about that. Definitely take out the seal. I just burned the crap outta mine, and it melted out....then I sanded it out, seasoned with a little veggie oil, and repainted the whole top of the lid with the same high-heat paint. On my second drum, I actually turned the whole thing upside down, and use the flat lid, clamped on, as the actual bottom of the smoker. I cut the "bottom" out of the drum with a cold chisel, and put my lid on that end. That is pretty typical of most closed end drums. The open ends have the bigger lip, that is too big for an unmodified weber lid. The welded or rolled edge on the bottoms, usually accommodate a weber lid perfectly. Mostly lump also, but I have used 100% hardwood briquettes from Trader Joes. No fillers, and no additives. Lump is still better though, but not as uniform to arrange in the basket. Lump only in my drum. WOW that is an amazing thread. It has been going on for years. Unfortunatly I do not have time here at work to read everthing, however with the hour I just spent reading I think I got pleanty of info to start my project. I love the UDS on the trailer rig. Really all the UDS were good. Does it fit the top of the drum or do you have to modify it? hey cool drum did the cone fit the top of 55 drum or do you have to modify it? I've burned out the drum tonight, and it's going together this weekend. WooHoo! Thanks everyone for your posts and ideas. I'll keep everyone posted, and pics soon to come. Ugh. Guess I should have read a few more pages. Missed it by 12 hours. I honestly don't see the need for more than one rack for what I plan on ever doing, so I'm not freaking out, but I would have liked the option to go for two! Cheers all. If the snow/sleet/crap ever stops, I'll be able to fire this thing up. One question for unlined cans, do you rub the barrel with oil, or do you just straight up cook? Any suggestions on getting the remaining corn syrup residue out of my open headed drum? On the sides it is basically clean and the bottom probably has an 1/8" of solidified corn syrup. I am thinking I will just use it as a burn barrel to burn my wood chips and bark from a winter of chopping wood and then I will have a "seasoned" barrel to build my smoker with. p.s. My other concern is that I get a burnt corn syrup/ash debris caked to the bottom of the barrel. Last edited by landlocked; 04-20-2011 at 05:55 PM..
No modifications to the rim of thedrum. The cone top required some mods. Had to weld 1/4" rod, flat stock and some Rutland rope and silicone to make it capture and seal to the drum. It's a tight, leak free fit though when it's done. How about a couple pots of boiling water to dissolve it. Thought I'd share something I learned when I started in on my closed head drum. I used a jigsaw to cut the top off. Easy, and quick. I cut right against the edge. Then I got my angle grinder out to smooth the inside edge. My weber top was slightly too small to fit the drum, so I started in shaving down the lip. Around and around a few times, checking the fit as I went, and suddenly the part of the lip cut from the lid came loose and I lifted it right off the drum, leaving only the drum wall lip there. A little more grinding and the webber fit like a glove. I didn't think much of this until I went to help my friend Adam open up his closed head drum a couple days ago. We were discussing how this lip came off and decided to skip cutting the top off and try to do it by just grinding the very top edge of the drum until we were just through the lids rolled edge. Sure enough, with very little effort, doing this easily separated the lid from the drum and made sizing it to his webber lid easy as well. 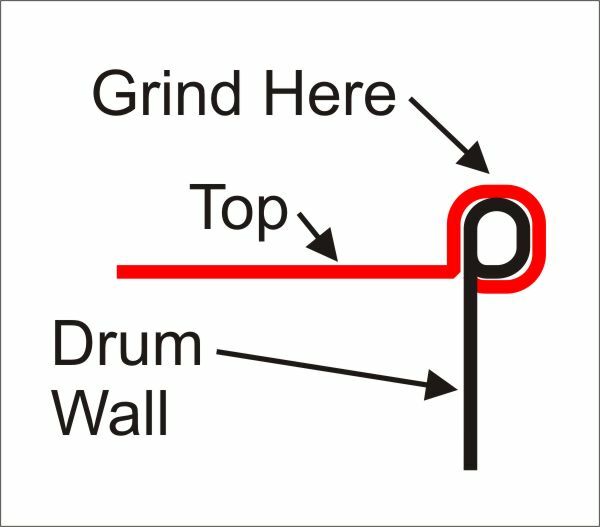 Here's a quick drawing I made of the way the drum wall is rolled and then the lid is rolled over that drum wall lip. And here's a quick youtube video I made of Adam grinding the top edge, and how easy the lid separates. I did another drum like this yesterday for another friend, and his was made from thicker metal, but it still separated mighty easy. Well, after tomorrow I'll have 10 days off to get the ol' UDS up and running. Can't wait to load up the forums with some pics!